Last week, Barry gave us his all new review of A Hunger In The Soul by Mike Resnick published back in 1998. This week it seemed appropriate to follow that with another review of Barry’s on a Mike Resnick book published that same year. While the review below has run twice before on this blog, it has been four years since the last time it appeared. 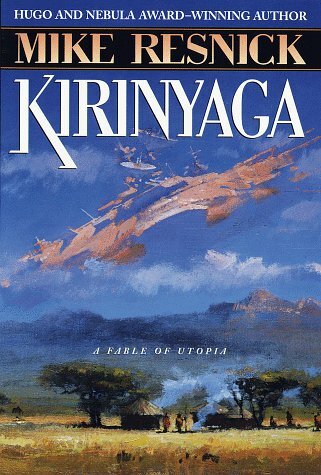 So, without further ado, I offer you Barry’s review of KIRINYAGA: A FABLE OF UTOPIA. After you read the review, make sure you head over to Todd Mason’s blog where he has the list. Also, please keep Patti and her husband, Phil, in your thoughts and prayers as they are dealing with the evils of cancer and the various treatment difficulties/complications. Cancer is a hellish war on the patient and the family. 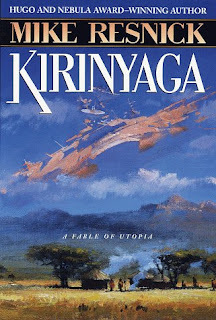 Among all of the highly readable, intelligent and well-crafted novels Mike Resnick has written, I have three favorites: Walpurgis III, The Dark Lady, and the book under consideration here: Kirinyaga: A Fable of Utopia (Del Rey/Ballantine, 1998). “In the beginning, Ngai lived alone atop the mountain called Kirinyaga. In the fullness of time He created three sons, who became the fathers of the Maasai, the Kamba, and the Kikuyu races, and to each son He offered a spear, a bow, and a digging stick. The Maasai chose the spear, and was told to tend herds on the vast savannah. The Kamba chose the bow, and was sent to the dense forests to hunt for game. But Gikuyu, the first Kikuyu, knew that Ngai loved the earth and the seasons, and chose the digging stick. To reward him for this Ngai not only taught him the secrets of the seed and the harvest, but gave him Kirinyaga, with its holy fig tree and rich lands. 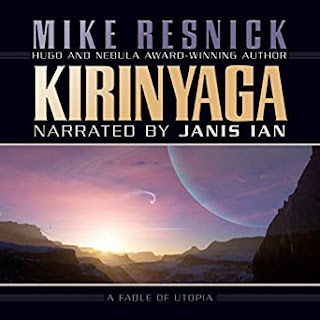 Along with a group of like-minded people, Koriba leaves Earth to live on a chartered, terraformed planetoid called Kirinyaga, where he reverts to the old ways of the Kikuyu. As their mundumugu, he’s the repository of the collected wisdom and customs of the tribe, living alone and apart from the rest but participating daily in their lives, the most feared and venerated among them--feared even by Koinnage, the paramount chief. Only Koriba possesses the computer that allows him to communicate with Maintenance, which can change the orbit of Kirinyaga to maintain or alter climatic conditions. Koriba uses this facility, unknown to his people, to his own advantage, bringing rain or drought as he sees fit, often to fulfill his own prophecies and prayers to Ngai. Each chapter presents Koriba with a new problem that threatens the Utopia he and the others have created. Invoking tribal laws with a fanatical stringency, he tries to find solutions. Not all of the solutions are happy ones, but Koriba is determined to prevent any change that will corrupt tradition, even if it means bettering his people’s lot--by what he sees as European standards. Ultimately he is forced to realize that change in a society is inevitable, that inherent in the concept of Utopia is stasis and stagnation, and that one man’s idea of perfection can be another’s agony. Resnick’s artistry lies in portraying Koriba’s fanaticism so that the reader is simultaneously repelled by and sympathetic to it. He and the other characters, and the problems that befall them because of the society they’ve created, will resonate in the reader’s mind long after the book has been put down. Easily Mike Resnick’s finest work, Kirinyaga is, to date, the most honored book in the history of science fiction. Read it, and you’ll understand why.